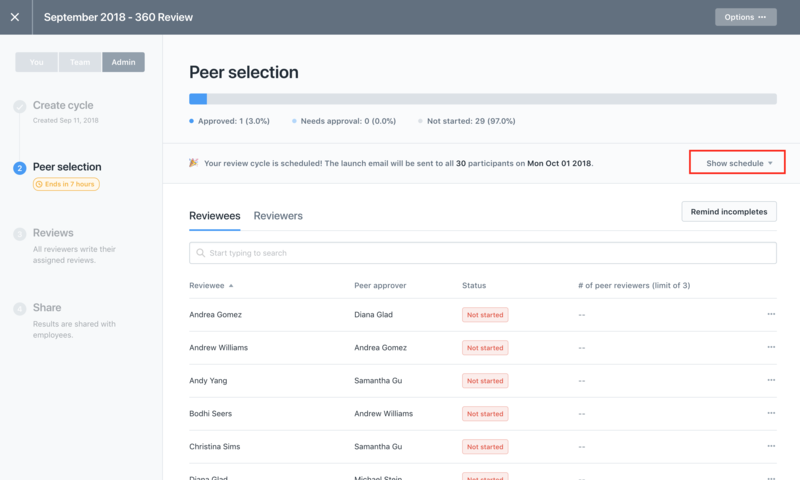 During review cycle set-up, Admins (or managers given permission to create review cycles) have two options for how the review progresses through each phase of the cycle— a custom (manual) or timeline (automated) sequence. If, for whatever reason (perhaps your timeline is too slow or too fast), you decide that you don't want your review cycle to run automatically anymore, you can easily take manual control over the sequence. Doing this will return it back to your control, letting you move it through the phases manually. Please note: Once you take manual control of a review cycle, you cannot put it back on a schedule anymore. For example, let's say you are in the peer selection phase and it's about to end, however, you have noticed that not everyone has selected their peers. You may want to take manual control over so that you can wait until everyone has made their selections. 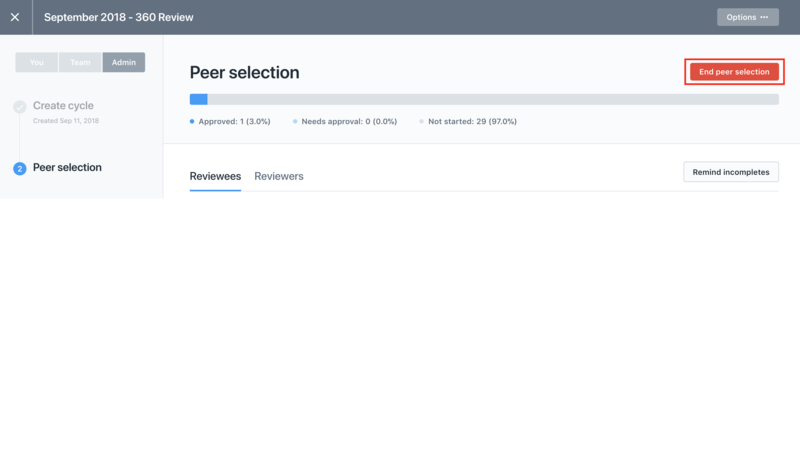 To do this, you would click into the "Peer selection" phase found on the left-hand side when in your review. Step 4: From the drop-down, click "Take manual control"
Once you have taken over manual control of the review cycle, remember that you will need to manually end each phase. Using "Peer selection" as an example, once you have taken manual control, you will need to remember to go back in and select "End peer selection" as the phases will no longer automatically move along. If you would rather change the dates in your Timeline rather than take over manual control, you can learn more here.